My childhood best friend's mom taught us to knit when I was in 3rd grade but I didn't remember much past that year and I've often been jealous of knitting friends. The last few winters I've thought about learning to knit again but haven't followed through. This winter, though, I'm determined to do it. When I won a copy of The Knitter's Dictionary, it seemed like a sign! This is a thorough resource and I definitely feel more empowered to knit. There were so many terms I'd never heard of before. It's easy to understand and well organized. Atherley did a great job putting it together. I'll need more than this to get started on my first project but I have no doubt I'l be referring to it often once I become a true knitter. From "alt" to "yrn," knitting patterns have a unique language of abbreviations and knitting techniques. The Knitter's Dictionary is your comprehensive resource for understanding the language of knitting in a quick-reference guide that no knitting bag should be without. For beginner and skilled knitters alike, there's always something new to discover in your next handknit project. The Knitter's Dictionary puts an expert knitting instructor in the palm of your hands to help you navigate any pattern. Within this knitting bag necessity, you'll also find Over 150 illustrations showing you everything from the difference between a toque and a beret to how-to information to increase and decrease stitches. Handy cross-references quickly lead you to exactly the information you need whether you've come across a new abbreviation in a knitting pattern or you've forgotten the steps to a long-tail cast on. Extended information on more challenging topics like taking measurements, understanding gauge, and fibre care instructions make this more than a dictionary--it's important information no knitter should be without. Packed with bonus tips and tricks, learn the do's and don'ts of pattern knitting making patterns easier and more enjoyable to knit! The Knitter's Dictionary gives knitters the answers they need when and where they need them in a precise and helpful way. Give yourself or another knitter the gift of knowledge with this must-have resource. Disclosure: I received an advanced copy from Bookish First in exchange for an honest review. Affiliate links included in this post. I admit it. I like planning parties. Hospitality is a gift of mine and I welcome gathering people together. Because of this, I rarely stress over the planning or the party itself. If the unexpected occurs, I figure it makes the party more memorable. My friends Donna, Jen, and I moved in to an apartment shortly before July 4. It was the perfect opportunity to open up our home. We threw up some patriotic decorations, lined up menfolk to tend to the grills, and asked friends to bring a side dish to share and whatever they'd like to drink. Popular party planning wisdom says only a third of your invited guests will show up. Apparently we were the exception to that rule. I don't remember how many people we originally invited but we had an open door policy. In total, about 90 people cycled through our loft apartment that day. They congregated in the kitchen, our 3 bedrooms, the stairs, the dining room, the living room, the balcony. Wherever they could fit, there they were. And you know what? I loved every minute of it! (It's possible Donna and Jen were stressed by the unexpected numbers- I don't remember.) As long as my guests feel comfortable and welcome, I'm good. Perhaps that's why people still talk about that party in glowing terms. However, I recognize that I have more to learn as a hostess and party planner. When my blog friend Mary Carver mentioned she'd written an e-book on this very subject, I was more than happy to review a copy. Let me tell you: Plan a Fabulous Party (Without Losing Your Mind) is more than worth reading. This is a fantastic resource! Step by step, from picking a date to settling on the food, Mary walks us through the party planning process. Whether you're organizing a board meeting or throwing a pig roast in your back yard or this is first (or 100th) party you've ever thrown, you'll find the checklists and planning templates to be quite helpful. One of the biggest takeaways for me is in terms of theme. I typically don't fuss over decorations, though I'm impressed with my friends that do. I focus more on the food and guests. Unless it's a shower, which is my least favorite type of party to throw (bo-ring). The positive side of showers is that I'm forced to bring my usual creativity to every aspect of the party planning process. I've thought more in the past year about being more intentional with theme and decorations. I really liked Mary's point that a theme is a unified approach. It helps us establish the purpose of the party. If my goal is for my guests to feel welcome, then how can the details of the party help me reach that goal? If the goal is for a birthday girl to feel celebrated, what are ways we can show that through the food, decorations, and favors? I picked up more tips and takeaways than that but you'll have to buy a copy of Plan a Fabulous Party (Without Losing Your Mind) for yourself, read it, and get back to me. Then we can discuss what parties we'll be planning next. Don't worry, Nashville friends. You'll definitely be benefitting from my newfound expertise. Do you enjoy planning parties? What's the most memorable party you've ever thrown or attended? Disclosure: I was provided a free copy of Plan a Fabulous Party (Without Losing Your Mind) with no expectation that I would provide a positive review. The thoughts, opinions, and reactions are entirely my own. Affiliate links contained in this post. If you purchase this e-book, I'll get a few pennies to help support this site. My house was pretty well decorated within a couple of months of moving here. Except for the office. 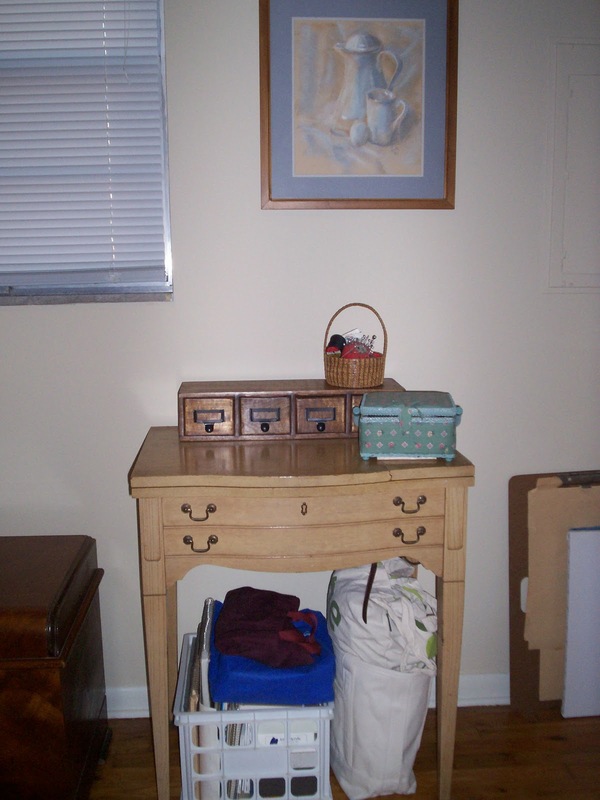 I needed a crucial piece of furniture and because it was not easy to find, the office became the burying ground for still-to-be-unpacked boxes, random projects, and anything that didn't have its own home. It was a disaster zone and I felt stressed whenever I looked in there. It should have been the place I did most of my writing. Instead, it became an excuse for why I wasn't writing. 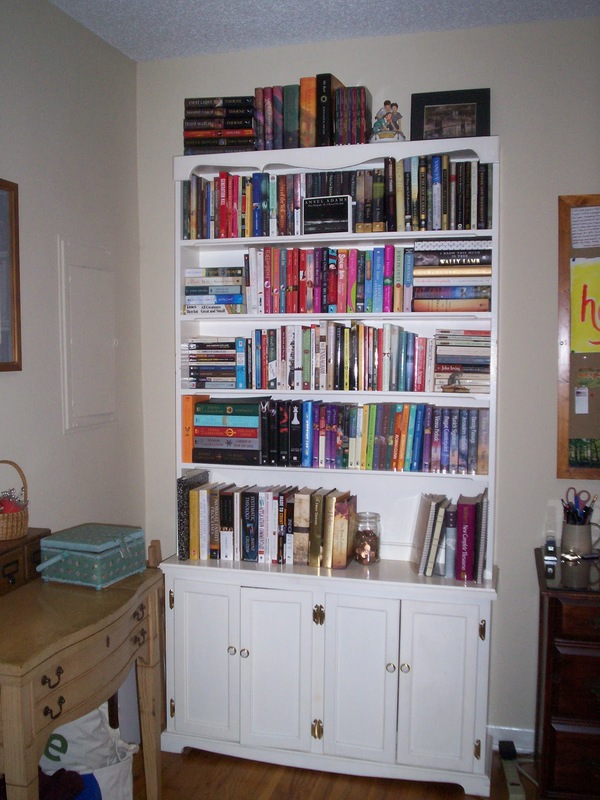 I write posts for this blog in the living room but my "real" writing requires its own space. This needed to change. When I sat down in December to come up with 32 Things, I knew that finally organizing and decorating the office needed to be a priority. It was holding me back and I knew I would feel better having that space finished. I've alluded to some changes I've wanted to make and a new direction for my life. Organizing my office is one of the first steps I needed to take. After months of searching, I finally found the CD cabinet of my dreams. Then my parents and brother gave me a very generous birthday checks so I could buy said dream CD cabinet. Last week it arrived! It was time to get to work. This past weekend I unpacked, I stored, I cleaned, I finished projects, and I redecorated until everything was just as I wanted. Y'all know I love my music. It's been pure torture not having access to all my CDs the past 9 months, searching through boxes whenever I had a yen for a certain artist. And yes, I prefer CDs to other music medium. Just as people hold on to their records, I will be holding on to my CDs until I am old and gray. The fact that I'm also a book nerd instantly endeared me to this CD cabinet which is fashioned as a library card catalog. Love, love, love this! The color wheel, incidentally, is something I painted in a college painting class. It's a nice spot for it, isn't it? 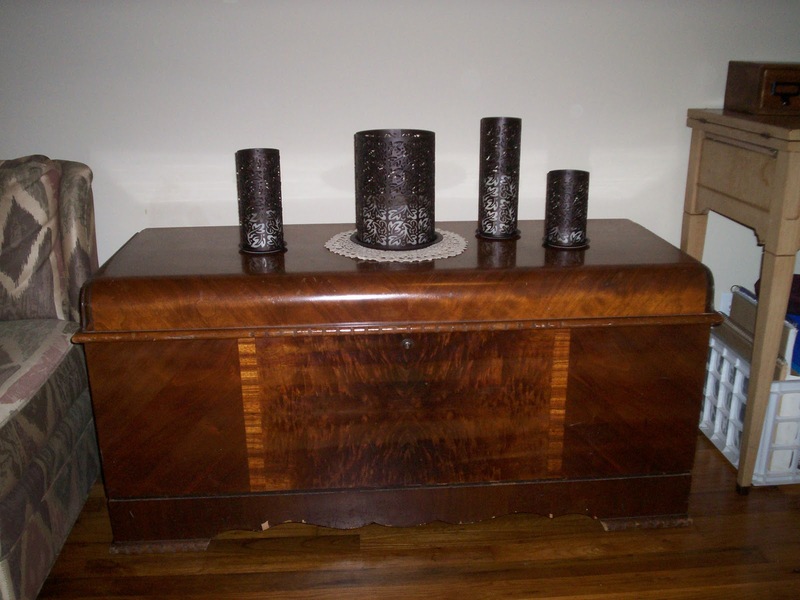 My grandma's cedar chest with my Thai Inspiration candle holders from PartyLite. That's no table! It's my grandma's sewing machine. Art supplies underneath, along with my sewing projects. Such a handy crafting space. The framed artwork is a pastel piece I did in 8th grade. I used to love nothing more than sitting with my sketchpad or an easel. My dad built this bookshelf for me many moons ago. Even though I'm particular about the books I buy and keep, I'm clearly running out of room here. My desk hasn't been this clear in a long time. Even my inspiration (bulletin) board got an update. 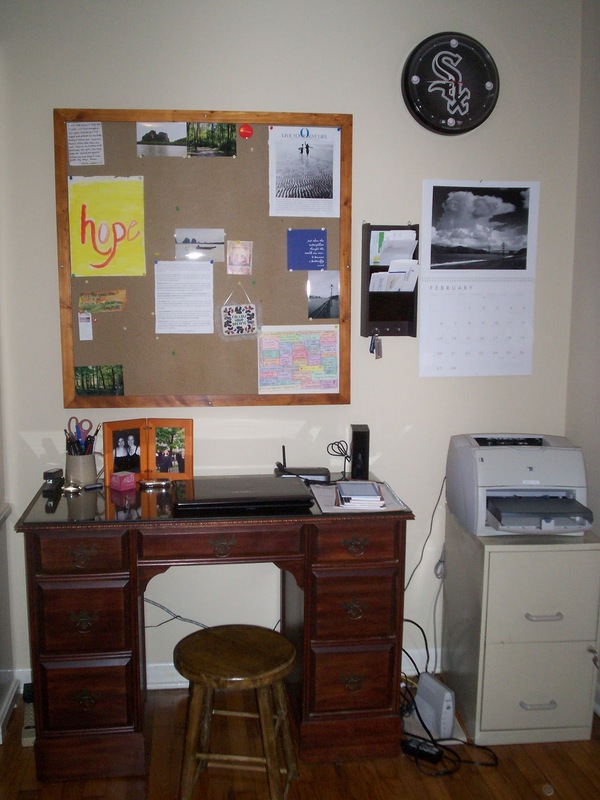 The bulletin board used to be in the dining room of my apartment. There was often a quote board for silly things friends would say during parties. I put up funny comics and inspirational sayings. This was good for something in the common area. There's still room to grow, as you can see. One of my favorite new additions is words from Emily Freeman's post "5 Ways to Guarantee Your Art Isn't a Waste of Time." Her words sink down deep and I will take them to heart as I begin to seriously craft my words. It felt good to stand in the middle of the room Sunday afternoon and see the fruit of my labor. This is a space to write and create. This is the space from which I will write my book. It's time to dive in and let the writing out. A notepad is next to my bed for the times the words won't leave me alone, as they often do when I'm in the middle of working. I'm not able to write full-time yet, not even close, but I know someday I will. For now, as Mary Kathryn says, I'm doing the thing I must do, so I can do the thing I must do. Saturday I have a date with my laptop and my office. My book starts now. Create modern Christmas cards at Shutterfly. I had originally planned to have pictures taken at a Nashville landmark or two and use one of those for the card. Timing just didn't work out so I started to think about using pictures from one of my 31 Things. And then I looked through the flambe action shots and was absolutely inspired! I cut out and glued my Highlight list on the back, added a written line or two, signed my name, and called it a day. I love how this card turned out! *11th consecutive White Sox home opener! Wishing you and yours a very happy Christmas celebration and best wishes for the year ahead! Disclosure: I received 50 free holiday cards from Shutterfly for this review but all thoughts are my own.